Like buses, you wait ages for one and three turn up at once... In this case, it's three special bottles. Two first bottlings from a distillery (Eden Mill, St George's) and a closed distillery (Caperdonich)! 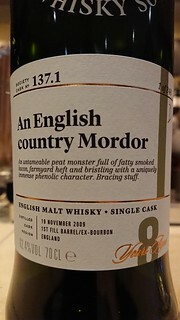 The star of the list was the St George's, which showed how good the English Whisky Company has become at their craft. Smoky, sweet, floral and herbal - it's a great cask. Caperdonich returns after an absence of four years, providing a lovely soft dram with fruit and floral notes and a hint of old oak or tobacco. Not a big experience, but one worth trying before casks from this closed distillery are never again available. Looking at the ones I'd like bottles of, let's start the the surprise - the Caol Ila. It's smokey and honeyed with some fruit - and turns ashen with water. I doubt it will last long on the bar! And also peated is the Croftengea, which smoke, fruit and walnuts. Surprisingly complex for 7 years old! Which brings us to the Strathclyde, another surprisingly young whisky at 12. Pineapple, hoisin sauce and toffee show that a well treated young grain can do very well... Finally, we should mention the Inchmoan, which was filled with violets, peach, leather and marzipan. Very satisfying! An honourable mention from my previews would be the Glen Grant. It's just got a little too much ginger for me to love it, but that won't stop me from recommending it as it's still a very good dram! The pick for many will be the Ardbeg - which is smokey, tarry and has lemon. Demand is usually high for this distillery, so this one's only available by ballot! If you're looking for unpeated whisky, the Benrinnes is a delight - beautifully balanced and subtle, with floral notes and fudge. I'm a sucker for bourbon casked Dalmore, and this one may be simple but it's exactly what I wanted - pears, green apples, and custard. The remaining three are also pretty good, but stand in the shadows of those three. Still, it's worth getting to the rooms and trying them all! The hardest part when writing about an SMWS list is introducing it. Especially recently, where the quality has been high and getting higher. But this list is for the Society's 35th birthday, when we have a number of birthday events. So, did they find a way to make it special? Well, I'd argue that they have. There are two standout whiskies here, and they are both superb representations of Society bottlings. First, the Glentauchers, which is a beautiful sherried whisky that tastes older than the 10 years it has. 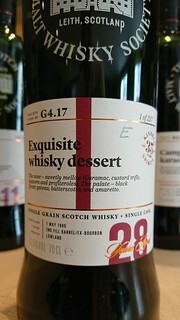 The second is the Cragganmore, which is precisely as old as it tastes and displays fantastic balance. What does it share with the Glentauchers? Well, apart from sherry influence, both are interesting drams that defy expectations and provide superb whisky that you'll want to share with your friends. If the Glentauchers were ten years older, it would be far less remarkable. If the Cragganmore were from a distillery with a higher public profile it would be priced out of most people's reach. But here we have whiskies that most people can afford to taste, and that are far enough from people's expectations that they'll always cause conversation. If that's not what you joined the Society for, then you're in the wrong Society. So the top spots are taken by sherry - which is unusual for me. But not everyone likes sherry - so for them I recommend the fresh and sweet Inchmoan, or the odd Linkwood that has flavours which shouldn't work together, but do. Moving towards peat, we need to mention the superb Glen Scotia, which delivers an oily and citrus experience with slight smoke. But the real peat freakery happens with the two Caol Ilas (lightly peated, heavily peated). 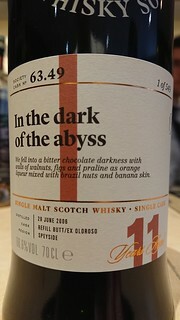 I preferred the honeyed notes of the more heavily peated bottling, but wouldn't turn down the lighter dram. All in all, it's looking like a great celebration of the Society this month. Get to the rooms, before it's all gone! Read more about SMWS Outturn 269 - Up, up and away! The August list has pretty good scores, but a fair bit of spice. The sweet, subtle and shifting Miltonduff won't impress those who like big drams, but it's seriously good for those of us who like a light and balanced dram. It scored 4.5, and I wish I could afford a bottle! The constant small changes are a delight. Then there's the Mannochmore, which is honeyed and fruity. Finally there's two peated drams, both of which (unusually, for me!) also scored 4.5. The Ardmore is, to use colloquialism, "delightfully bonkers". It has sweet, savoury, fruit and smoke and it shouldn't work. But sometimes whiskies manage to deliver the flavours in a way that binds it all together, and this happens here and saves the day! And finally my favourite of the evening was the Glen Scotia, which has some tar balancing out fruit and soy sauce, with more going on as well. A great dram to finish on! 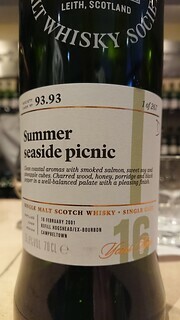 You should also try the Glenrothes - a nice bourbon cask that's done a great job, and it really suits this current weather. 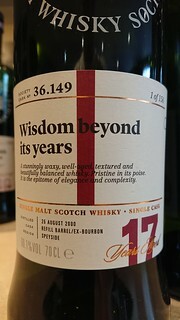 It scored 4, as did a the unusually spirituous Glengoyne, which has a lot of fruit alongside the spirit notes. And the Glen Moray's re-racking was also very successful - although a little too much pepper for me. The mid-month releases are upon us! The star of the show is the Cameronbridge, which has sultanas, profiteroles and other joyful notes. I tried it with the staff at the bar, and even the non-grain fans were impressed! The Balmenach is an alcopop whisky - so fruity and easy to drink! And the Dailuaine is a great whisky that just didn't quite do it for me - but you should try it and make up your own mind! 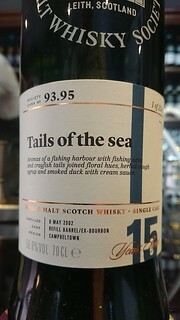 Finally, there's also a Glen Scotia - which is a lovely coastal dram. July is a slightly smaller list than usual, with just 18 drams and one of those is mail-order exclusive. And yet there are also venue exclusive bottles and the usual mid-month top-up... So over the whole month it evens out! 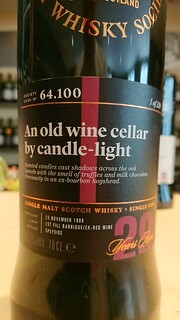 The quality's high - lead by the superb Caol Ila which I think has depth we don't normally see from this distillery. But why should we stick to scores? Let's look at everything else by using the new scoring system! In "I'd like more than one bottle" there's the Auchentoshan which is delightfully fruity with floral hints. Very tempting. The sweet, gingery Mannochmore is something that probably wouldn't last long when opened! As is the Springbank, despite being the polar opposite - a superb sherry casked dram with a hint of sulphur. Finally, how about the wonderful Ledaig? It's maple and bonfire smoke, and wonderful. "I'd like a bottle" scooped up quite a few too! There's the Linkwood with its floral, fruity and oak notes, the Dalmore with fruit and cinnamon. The Glen Grant also has plenty of fruit and a little cinnamon, but is quite different. The Strathisla and the Ardmore are both very good, and when's the last time you saw a Speyburn from the Society? The June mid-month release is an opportunity to restock on the peated drams... As seems to be the new normal the preview tastings were divided between myself and Matt at The Dramble, and this time I seem to have drawn a somewhat peated hand! Although there are only six previews, we both got to produce tasting notes for the Bruichladdich - I'm looking forward to comparing them, as I can assure you we don't see each other's notes ahead of publishing! Before we get to the peat, there's a good Bushmills that delivers plenty of fruit and roses. A rather less peated Bruichladdich is in the oily and coastal category, probably because the peat comes out as dry dusty earthiness. But there's plenty of fruit and vinegar in there too, making it a true chimera and a joy to drink. 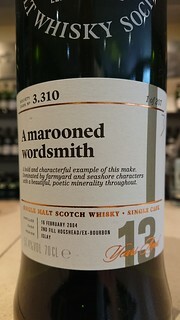 If the Bruichladdich is light in is peating, so is the first of the peated whiskies - an excellent Ardmore that has glazed ham, cough medicine and hints of smoke. But the real gem is the Bowmore, which balances pink wafers and lavender with earthiness. These are true summer peatings - lighter and sweeter, and quite enticing in the warm weather. The older Bushmills bottling was a lovely, sweet and fruity delight. I also very much enjoyed the Loch Lomond Rosdhu grain, where the real surprise for many will be that it's a mere eight years old. In a market full of aged grain, this shows that you don't need years - just good wood. And speaking of good wood, the reracking of the Glen Grant really worked, bringing big flavours that were also well integrated. Then there's the Laphroaig - another finished whisky, but again it works very well - albeit a bit ashen. 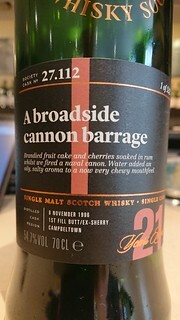 Finally, how about an unpeated Bunnahabhain that was matured in an ex-port Barrique? It's a sweet treat! All these whiskies have well deserved scores of 4.5. Scoring 4 was the Aberlour, another light and sweet dram. For heavier notes, try the superb Benrinnes - I may not like the somewhat heavy father's day marketing, but the whisky is a good one. It also demonstrated that a score of 4 isn't the end of the world - I'd like multiple bottles! One of my whisky reviews for this month's SMWS Outturn is for a whisky from a Lomond still. I get excited about whiskies from Lomond stills. When they get it right, they tend to get it really right. They often have a wonderful velvety smooth mouthfeel, as well as lots of flavours. Of course, not everything from a Lomond still works. But when it does... wow! So what the heck is a Lomond still?